As Wendimoor falls into chaos, the Mage enacts his final solution, putting both worlds in dire jeopardy and forcing the heroes to face off against the villains. Amanda and Todd must overcome their differences to help Dirk. 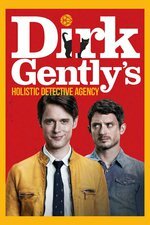 Den of Geek - With so much death, what’s left to hope for in this tragic penultimate Dirk Gently’s Holistic Detective Agency episode? I think Moloch can reset the world and give us the happy ending. Looking forward to Chekov’s mage wand. I want 10x Mona Wilder. I was so happy to see Hobb still alive, but now I'm just anxious for the finale. I want the big happy ending, but I don't really trust the show to give it to me. Ah well, fingers crossed for next week's finale. How crappy are the Blackwing soldiers, getting taken out by a bunch of medieval knights? THERE'S A LOTTA WEIRD IN HERE! Why would I turn into a silly little bear? If I wanted to kill you, I'd just turn into an aircraft carrier right now, and this entire place would be destroyed. I enjoyed panto being able to demonstrate his excellent scissormanship skills. Panto is, er was an excellent scissorman. RIP Panto, Silas, their families and their people. I guess The Boy/Project Moloch (dark reference, that one -- "the biblical name of a Canaanite god associated with child sacrifice," referenced figuratively in English literature "to refer to a person or thing demanding or requiring a very costly sacrifice") might be able to be revived and make things better, but given his namesake and his past, that seems highly doubtful. Question: where did Bart pick up the idea that Wendimoor was going to have a "big happy ending"? *I've forgotten - is the dog just a dog now, or is it someone in the body of a dog? Think the dog is just Rapunzel the dog. Lydia got ousted last season. I get the sense that Ken is trying to turn Blackwing into a good organization, but still with the purpose of containing people with power, especially after he read through their history. I did see a few knights actually going down by bullets, but it's really surprising that Blackwing people didn't have any kind of bulletproof vests, but it could be because they're in the facility and caught with the vests down. oh yeah I should note that on first watch I thought box-helmet hands of the Rowdy Three said "there's a lot of weed in here!" while looking down at the ground as they're leaving, which makes sense and also hilarious. but the actual transcript is still hilarious. Did they not say "there's a lot of weed"? What did they say if not? I just sort of accepted it was a Rowdy 3 thing, much like the other things they say. Is there a list of all their off-hand comments somewhere? The kiss from Bart to Ken. lol. I was glad Bart was able to dodge projectiles in Wendimoor. I was so very happy to see Bart with the chainsaw. Hey now. Bart doesn't dodge anything. She's just not where they are. True enough. I was just glad to see stuff wasn't hitting her in Wendimoor. Did they not say "there's a lot of weed"? What did they say if not? The transcript came from springfieldspringfield.co.uk, which has them up pretty quickly and typically accurate. I've been using them while I watch the show the next day because the captioning on BBCAmerica's site is gigantic and takes up like a whole bottom quarter of the screen if not a whole third, you can't even adjust it at all. Mindboggling. One of my roommates, while great at english, it's not his first language, and generally it's easier for him if we watch stuff with closed captioning. It's for sure "weird". Alas, we are running out of story for Hammerhead Kitten to make an appearance in this season. Although I suppose it would be Hammerhead Cat at this point. Maybe we need a spin-off comic, or some short webisodes. The line works for me with either weed or weird. Because it's this show. I have also been wondering when Hammerhead Kitten is going show up and fix everything, mikepop. They're leaving it a bit late. "Don't Panic". Wise words to live by, Dirk. "Hey now. Bart doesn't dodge anything. She's just not where they are." Bart is my favorite thing in the show. The whole idea of her feels completely original and is very fascinating.